The Didi 38/40 has become one of our most successful designs, now being built the world over. The radius chine plywood design was an experiment that has grown into an expanding range of performance concepts primarily for amateur builders. The Didi 38 was offered from the start with extended stern and longer cockpit, aimed mainly at improved racing efficiency. 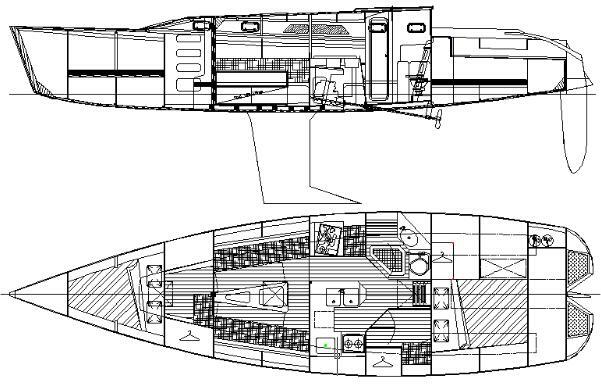 A demand has developed for this extended hull to be combined with a short cockpit and longer cabin, for improved cruising comfort. We now offer this alternative. As a cruiser, we suggest that she be built with 18mm skin rather than the 12mm standard for the Didi 38/40. This will give her more resilience for long life and safer cruising.